The body of Brett Olson was recovered on the Sacramento River this morning, and the Lafayette student’s parents identified the body as that of their son, reports Mercury News. The body was found down river, just upstream of a washout, on Sunday morning. People fishing from the bank saw the body floating in the water, flagged down a boat on the river, and the body was recovered. 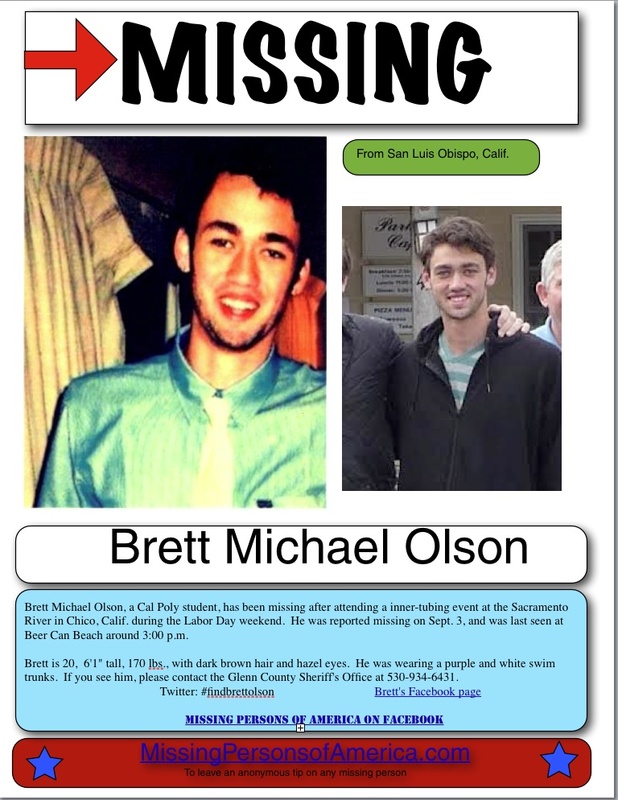 Previous Story: Brett Olson a Cal Poly student has been missing after attending a inner-tubing event at the Sacramento River in Chico, Calif. during the Labor Day weekend. Brett went to Chico with some friends to attend the Chico’s annual Labor Day weekend river float. Brett is from Lafayette, Calif and is currently living in San Luis Obispo, Calif. He was reported missing on Sept. 3. He was last seen at Beer Can Beach around 3:00 p.m.
Brett is 6’1″ tall, 170 lbs., with dark brown hair and hazel eyes. He was wearing a purple and white swim trunks.